FAQs - What type of smoke alarm should I be installing? Is it legally mandatory to install smoke alarms in rental dwellings? Current housing legislation states that all new dwellings or dwellings requiring building consent for additions/alterations are required to have a smoke alarm installed in the living area and within 3m of each bedroom door. This includes both private and rental dwellings. This is not a requirement for existing dwellings. However, from July 1, 2016 the Government has introduced new legislation making it mandatory for all new and existing rental dwellings to have working smoke alarms within 3m of each bedroom door, on each level of the dwelling and in sleepouts and caravans. Failure to comply may result in the landlord/owner being fined up to $4000. What type of smoke alarm should I be installing? The new legislation states that from July 1, 2016 all new or replacement alarms should be photoelectric type with hush button feature and long-life battery (up to 10 years battery life). Existing smoke alarms must be operational and within 10 years old. Hardwired 240v photoelectric alarms with Hush and long-life battery back-up are also acceptable but require installation by a registered electrician. Is any maintenance required with these long life smoke alarms? Modern long-life smoke alarms are largely maintenance free. However all manufacturers recommend periodic testing by depressing the Test button until the alarm sounds, and cleaning every few months with the soft brush attachment on a vacuum cleaner to remove potential dust buildup or insects. Why do smoke alarms require replacement every 10 years? Aging smoke alarms don't operate as efficiently and often are the source for nuisance alarms. The international standard for smoke alarm replacement period has been determined at 10 years to maintain sufficient product performance. This is backed up by local legislation. How many smoke alarms do I need and where should they be installed? The new legislation states that a smoke alarm should be installed adjacent to all bedrooms, and at least one on each habitable level of the dwelling. 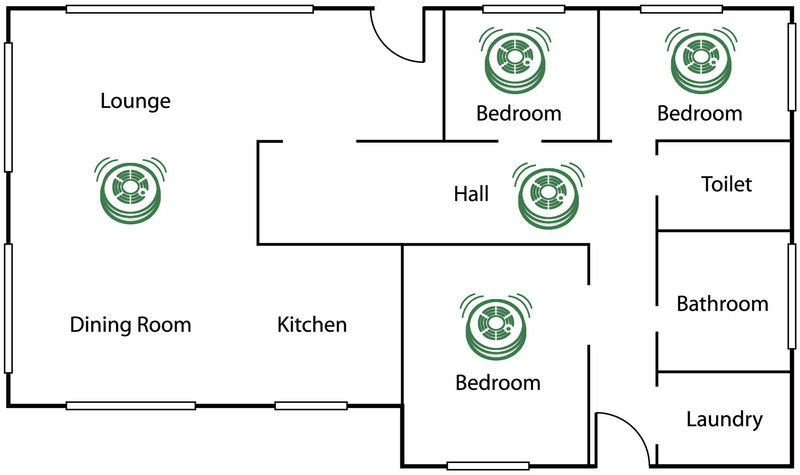 For each bedroom, there must be at a minimum one working smoke alarm in the hall or similar, within 3 metres of the bedroom door. In a self-contained sleepout, caravan or similar there must be a minimum of one working smoke alarm. The NZ Fire Service strongly recommend a smoke alarm is installed in every bedroom to protect sleeping occupants. Smoke is undetectable to a sleeping person and many fire fatalities occur while occupants are asleep.